We're nearing the end of Colts Week, and this Throwback Thursday is dedicated to the last time the Patriots and the Colts met. I'd love to not talk about Deflategate ever again (and I'm going to do my best to mention it in this post as little as possible), but this week has sort of brought it back into the spotlight. I could be really short with this one and just remind everyone that the Pats blew Indy out and a complete firestorm was created over pretty much nothing, but that isn't as much fun. So let's not waste anymore time. 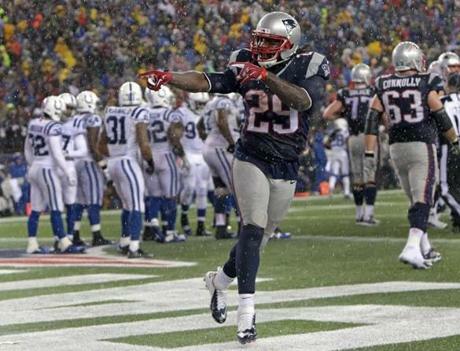 The 2014-15 AFC Championship game featured the top seed in the AFC, the New England Patriots, and the upstart Indianapolis Colts. The Patriots were coming off a highly emotional divisional round win against the hated Ravens that saw tons of back and forth between the squads. Meanwhile, the Colts had just gone into Denver and beat a Broncos team that underachieved mostly due to Peyton Manning's torn right quadriceps, which severely affected his play. The game got off to a pretty mundane start, as both teams traded three-and-outs. 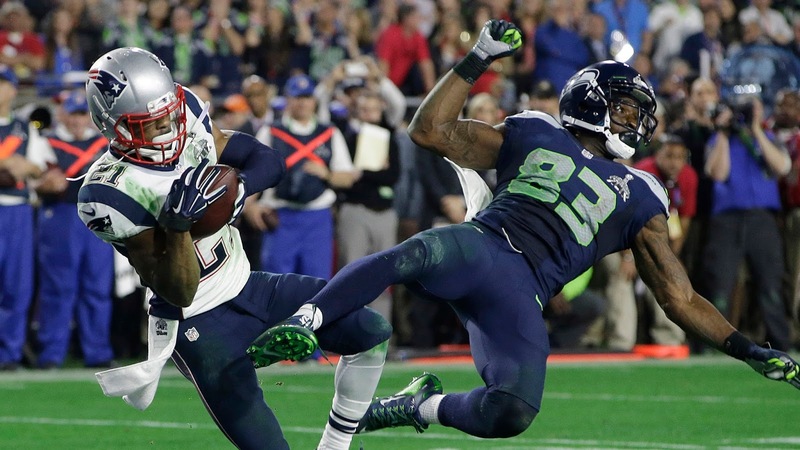 However, the Patriots would quickly redeem themselves. With the Colts set to get the ball back, returner Josh Cribbs botched a Ryan Allen punt that was recovered by Darius Fleming, which put the Patriots at the Colts' 26-yard line. Six plays later, Colts killer LeGarrette Blount ran the ball in from the 1-yard line to give the Patriots their first of many touchdowns on the night. As we know, the Colts run defense was pretty brutal against the Patriots in the last few meetings between the two. So it was basically a guarantee that we'd hear a lot more from Blount in this game. The Colts had a chance to cut into the Patriots' lead on their next possession, but it would be all for naught. Old friend Adam Vinatieri missed a 51-yard field goal wide right, which gave the Patriots another short field and a chance to build on their lead. And they'd do just that. Brady and Co. drove 59 yards and capped off a 3:30-minute drive with a touchdown pass to James Develin. 14-0 Pats. And now we get to where it would eventually get really interesting. After another Colts punt, New England got the ball back and were looking to blow the game open. Brady, looking for Rob Gronkowski down the middle of the field, threw and interception to D'Qwell Jackson. It was the second straight week Brady threw a head-scratching pick, and the second straight week the opposition cashed in on it. Andrew Luck drove his offense 93 yards to score a touchdown to cut the lead in half, but the Patriots weren't finished scoring in the first half. They used up the final four minutes of the second quarter to crank out a field goal, putting them back up by two stores. It was 17-7 going into halftime. In the second half, it was literally Patriots. Their first drive of the second half resulted in a touchdown, when Brady hit Nate Solder for a 16-yard score. It was the second week in a row the Patriots used a tackle as an eligible receiver. That's illegal now thanks to the Ravens whining and crying, but that's a discussion for another time. At this point, the fans inside Gillette Stadium started to get a sense that the game was over. The Colts looked totally hapless on defense, and save for the 93-yard drive in the first half, the offense wasn't doing a lot. The Patriots continued to pour it on, scoring three more touchdowns on three straight possessions, two of them coming from Blount. With a few minutes left in the fourth quarter and the game well out of reach for Indy, the Patriots pulled Brady, and he jogged off the field to chants of "Brady! Brady! Brady!" It was a fun and chilling scene from a sold out crowd that had seen so many victories over this 15-year run. A 45-7 final score punched New England's ticket to Super Bowl XLIX against the then-defending Super Bowl champion Seattle Seahawks. It would be the Pats's third attempt at winning the franchises fourth Super Bowl. But the win was met with controversy, as a few hours after the game, reports were surfacing saying the NFL was looking into the Patriots' use of deflated footballs. This came to be known as Deflategate. For a while, it was thought that Brady's interception to Jackson was what started the whole ordeal, but it turns out it was the Ravens tipping the Colts off about New England's use of possibly deflated footballs. The Ravens claimed the week prior that the Patriots deflated their kicking balls, but that rumor was proven untrue after we learned that the league handles those balls. 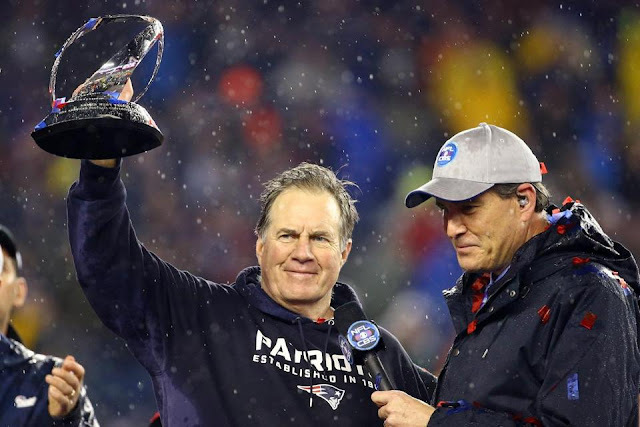 False stories ran rampant and the majority of fans were led to believe the Patriots cheated once again, even though there was no hard evidence against the Patriots. But because the Patriots were involved with Spygate back in 2007, it didn't matter that there was no evidence. The Patriots were already guilty outside of New England. It didn't seem to get in the team's heads, though. They'd go on to win Super Bowl XLIX and capture a fourth Super Bowl title that had twice eluded them. And while the controversy surrounding the team has quieted down significantly ever since Tom Brady's four-game suspension for allegedly being involved in a ball deflation scheme was wiped out by a federal judge, it'll be revisited in February 2016, when the league and Brady will go to an appeals court in an attempt for the NFL to get the ruling reversed. No matter what happened, no one will ever be able to take away the blowout in this game that was, as well as the eventual Super Bowl championship.